Diane Arbus was an American photographer known for taking square framed pictures of “freak” people. Although she didn’t want to be referred as such, it was inevitable after her never-ending desire to capture deviant, marginal and seemingly surreal people. Arbus was the first American photographer to have her work exhibited at the Venice Biennale, unfortunately after she committed suicide in 1972. Looking at this photograph she took in 1967, we see two little sisters side by side. As obvious from the picture itself and its name, the two sisters are identical twins, almost exactly the same in height, weight, hair length and pretty much in all physical aspects. Their parents clothed them equally the same and they became almost like a duplicate of one another. Identical twins do look very much alike and in most cases they look almost as if they are the same person. 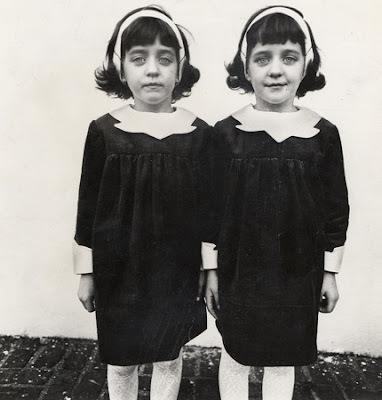 However, as Arbus’ photograph shows, they may have completely opposite personalities. Regardless of the biological links between two twins, they are different people with entirely different ways of thinking about and seeing things. The argument can be extended even further. If we can say that identical twins need not have the same characters, it is more than reasonable to think that every single one of us can have different characters, ideas and believes as well. After all we are all different people. But then, how and why can we appreciate these differences among two identical twins as we look at a photograph, but not among completely different people with different backgrounds when it comes to certain other subjects?